I know what you're thinking, and YES, I did go back to camp on Friday. I totally forgot to be nervous about it after "the incident" last week, and it all went just fine. 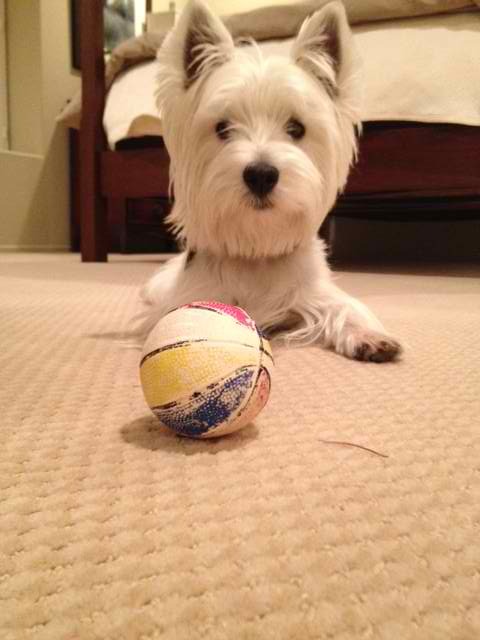 I came home so tired I actually did not want to play with my ball. I am not sure that this has EVER happenned before. I pretty much hung with my dad all weekend while Mom had one of her cleaning frenzy weekends. SHE WASHED MY BED, which I don't like it all. But better my bed than me, puppers. Better the bed than me! me, sleeping on the job, literally! Well whadduya think of this one, puppers? 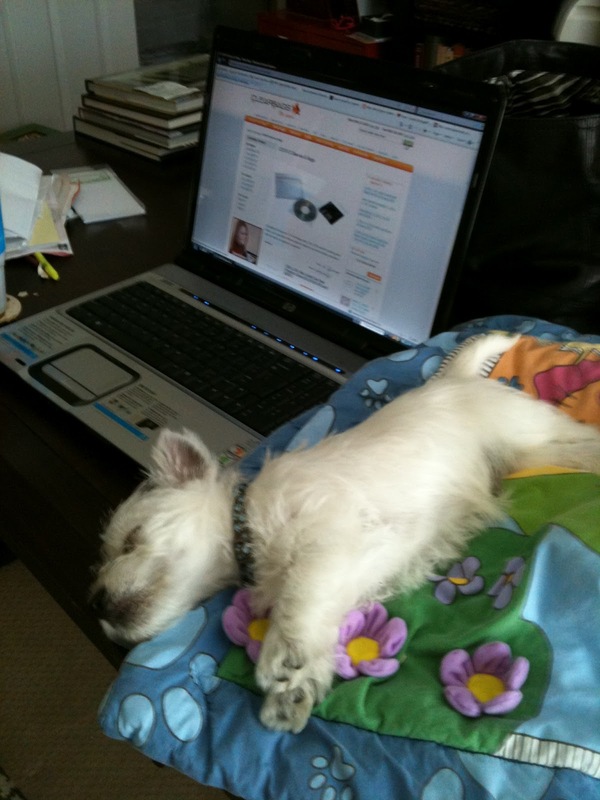 Sleeping on the job has always been a problem for me, and why I have always needed an assistant. (Thanks Mom!) I had forgotten, however, that it started so early on in my blogging career. Apparently I have been napping on the job since day one. Please stop sending my mom and dad to the pharmacy. Please stop making my paws itch. Don't you remember that I do NOT like going to the doctor's office ?!?!?! You are beautiful, but you seem to come at a cost to me and mine. We were walking the other night and came across these bushes that were blooming in full force. Mom said she'd never seen them bloom like that in all the years we've lived here. Plus, all this blooming was going on only about a quarter mile from our house and at our house the same plants are doing nothing. Nada. No bloomie. Go figure. Perhaps they knew they made us itch?? Sorry, but I've been recovering. You see, there was this little thing that happened at camp on Friday. I know what you're thinking already and it was so NOT my fault. I was just hanging out probably not minding my own business when all of a sudden this dude I had been playing with earlier in the morning decided we were not friends any more and got a little rough with me. Yowza, puppers. Imagine my surprise!!! And, let me remind you, I am in camp with the BIG dogs. I was shaken and stirred and, although I was just fine, it scared me just the tiniest little wee bit. Yep, took the skip right out of my step for a while. Had to rest in my own private suite for a couple of hours. 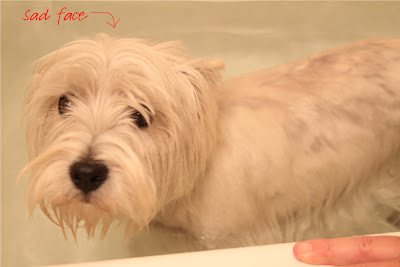 Then my mom had the audacity to suggest to the nice people at camp who had taken such good care of me up to that point that I have a bath. I don't like baths and she wants them to give me one on a day like I'd had???? The good news is, in the end, my mom felt so bad about the day I had had that she and my dad stayed home for the evening and let me snuggle up on the sofa with them and watch Animal Planet for hours and hours. Remember the other day when we said Happy Birthday to my Aunty Karen? Well she got a camera for her birthday and she sent us some photos she has taken with it. Don't you just love this one of my girlfriend Sophie back in Texas ??? 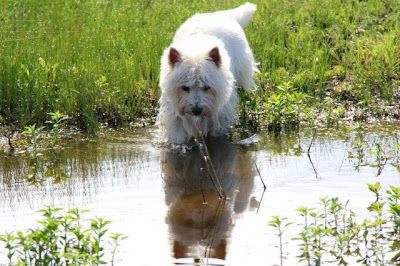 The reflection in the pond is amazing and we love that the picture captures the real essence of a Westie ... look at that dirty face!!! Note to self: Get Aunty Karen to come take some pictures of ME. You know, this being MY blog and all, I don't usually post photos of my assistant. But we thought some of you might appreciate the bluebonnets here. 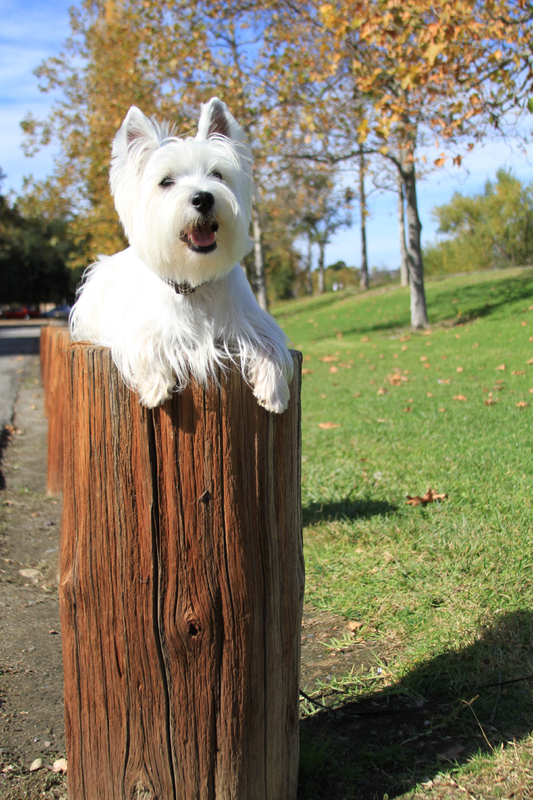 You see, I am a California dog all the way, by my mom hails from the Great State of Texas and we know some of you do too. 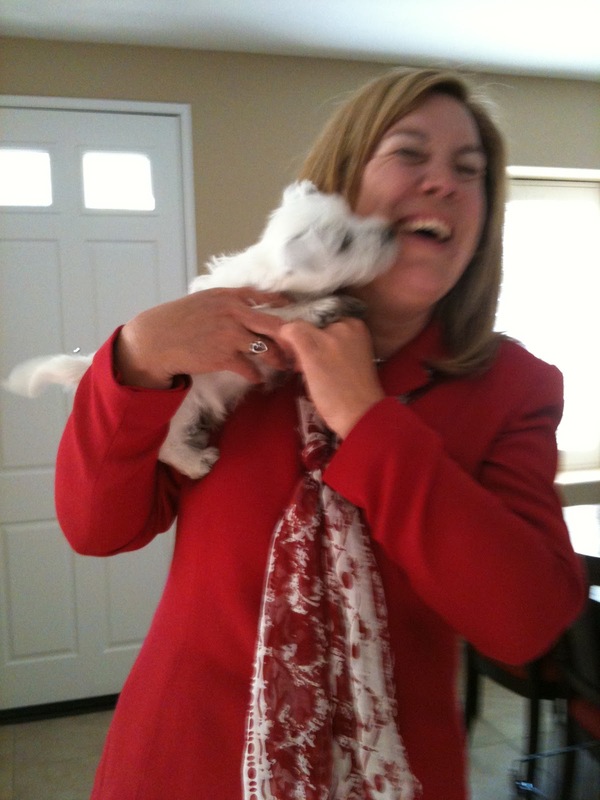 The other reason I am posting this picture today is that it shows MOM IS CHEATING ON ME AGAIN and I thought I would try to muster some sympathy for that. 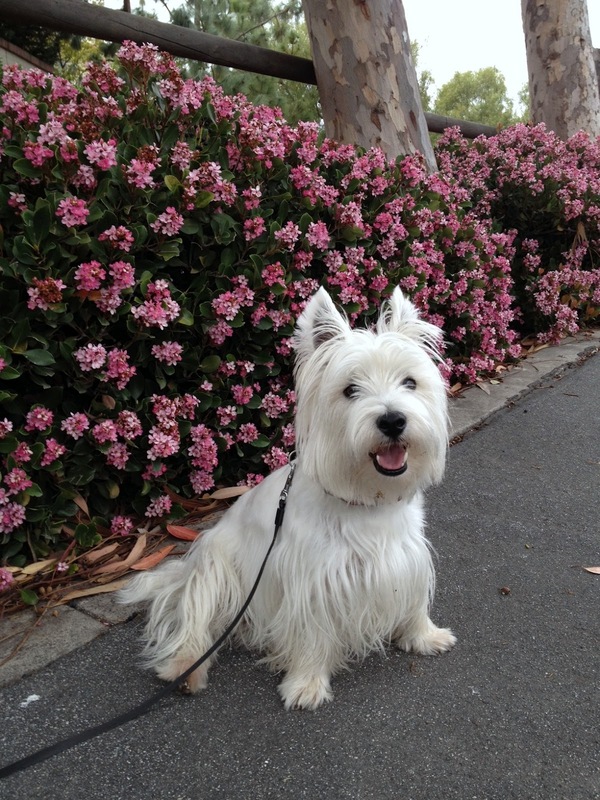 Well, hello, Scottie lovers ... this one is for you! 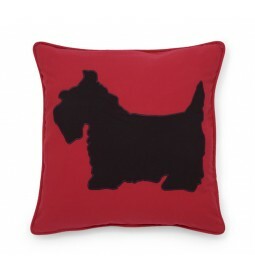 Mom found this pillow on her new favorite website C Wonder. You can check it out here. We love it, but don't you think it would look good in a Westie version as well? Sure enough, the Easter Pup did stop by my house. He left LOTS of treats including lots of the rolling kind. And, when I went all destructo on the rolly ones, out came the treats! Hope you all got lots of treats too!!!! You've been with me from the very beginning! Happy Birthday Aunty Karen ... we hope you have a FABULOUS day and that the Easter Bunny brings you extra treats for your special day!!!! Another great thing about this being Easter weekend is that there were TONS of dogs in my puppy camp yesterday. And .... we got to have an Easter Egg hunt .... THIRTY FIVE of us got to hunt for treats. And it left me absolutely exhausted. 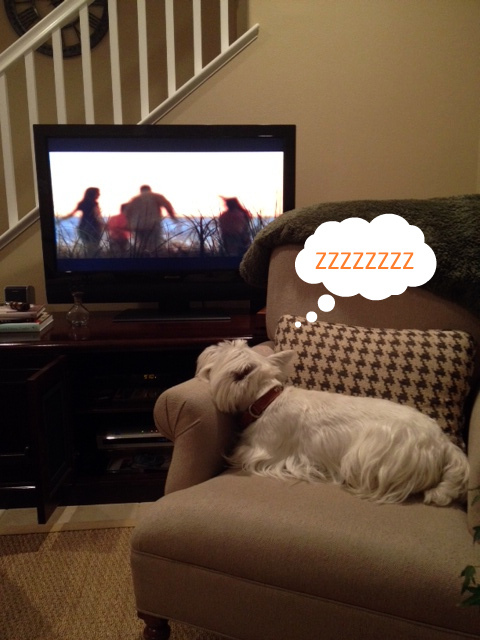 Mom caught me snoozing in front of the TV. I thought I was fooling everybody into thinking I was just catching up on Celebrity Apprentice but apparently I started snoring and gave myself away. Oh, and also so worth it!!!! You have no idea how excited I am. I have just figured out that this is the weekend that the Easter Puppy comes. You now, the dude that has paws like us but hops instead of walking in a more sophisticated way like we do not always. This is the four-legger who brings me things that ROLL, and I have a REAL THING for roundish things that roll. I have NEVER met a ball, egg or anything else spherical that I have not LOVED with all my heart. And this weekend I am even going to be able to bust some of my rolly things open and get treats out of them. Is there anything better, I ask???? You have no idea how proud of myself I am for not falling off of this pole!!! Well good afternoon puppers!!! So sorry we have been away for the past couple of days. You know what we say around here ... good assistants are hard to find and my mom mine has really been slacking off lately! She says she has alot on her plate right now and it is a real balancing act but my bowl runneth over with kibble and I am balanced on a pole too, so I am NOT accepting her excuse!!! Make no mistake ... I love my mama. HOWERVER, every now and then it is nice when she heads out for a weekend. You know, so me and my dad can have some quality MAN time. 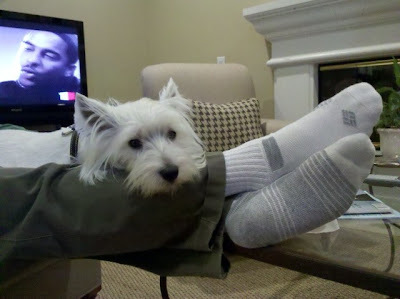 We like to put our feet up on the furniture, order a movie on cable and just hang out. To that end, I am thinking about ordering these bowls for our next "guy's weekend." I think they are pretty perfect for that ... don't you? 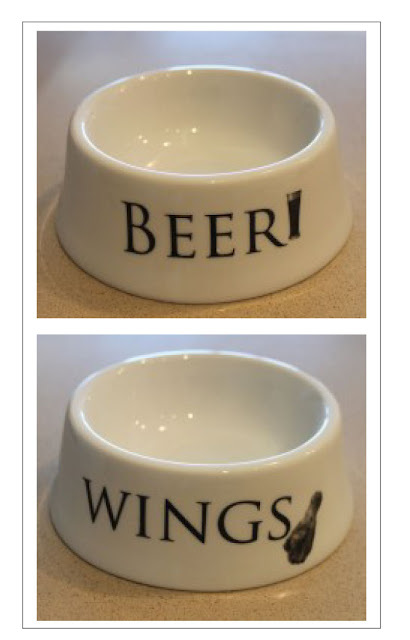 You can find them at DogChewz, along with some other pretty great things. And now if you will pardon me, I need to get back to my partying!